Annie received her B.S. in Business Administration in 1982. She spent the next six years in banking and commercial real estate working throughout the United States. Annie received her M.B.A. from Harvard Business School in 1992. Following graduation, she worked with the founders of TheraTx, Inc. a nationwide health care company focusing on rehabilitation. Annie joined Kate Grace Physical Therapy as a co-owner of the private practice sports and orthopedic clinic in San Diego, California in 1993. She is responsible for the operations and strategic planning for the clinic. In 1994, Annie co-founded OrthoRx, Inc., a medical products development and research organization. She was instrumental in the development and patenting of the OnTrack® treatment method for the most common knee disorder in the world, patellofemoral dysfunction. She created and managed the manufacturing, warehousing and distribution of the product. Annie recruited, trained and managed a nationwide sales force consisting of over 150 independent OrthoRx representatives located in 39 states. The most recent OrthoRx development is a software program called PostureRx™. This is a web-based tool for the professional clinicians within the health care industry. Annie and her business partner, Kate Grace, invented and patented the product. In 1995, Annie co-founded OrthoEd, an international continuing education provider. The purpose of this company is to teach medical professionals throughout the world how to make available state-of-the-art medical treatment for the millions of people who suffer from patellofemoral dysfunction. Annie and Kate have provided hundreds of educational seminars to thousands of medical providers throughout the United States, Canada, and Europe. In 1999 Annie was the sole founder of the consulting company, ProfitRx. Annie's goal in creating this company is to educate and coach medical professionals and small business owners about how to start and operate successful entrepreneurial enterprises. Since starting ProfitRx, Annie has taught the one-day course she designed, Creating the Ultimate Private Practice, to hundreds of American Physical Therapy Association (APTA) members. In 2002, Annie co-founded Snap-Saver, LLC with two partners. Snap-Saver was formed to manufacture, market and sell an innovative new line of food storage containers. Snap-Saver began offering its "No-Brainer Container"™product line to retailers across the country while utilizing home shopping and short form direct response television to create brand recognition. The "No-Brainer Container"™ design was recognized by Home World Business magazine and the International Housewares Association as the 2005 Housewares Design Award "Best in Category" for all Countertop Kitchenware. Snap-Saver was recognized in Entrepreneur Magazine as one of the "Hot New Products for 2006". In 2008 Snap Saver licensed it's patented technology to NewellRubbermaid and is sold throughout the United States under the branded name "Easy Find Lids". Kate Grace Physical Therapy was recently recognized as one of the Top 50 Women Owned Businesses in San Diego, and Annie was nominated as one of the Top 100 Women Who Mean Business in San Diego. In 2012 Annie and Kate ventured out to create a new model for the delivery of physical therapy and wellness services to individuals of all ages. They are determined to continue to provide world-class care to their patients and clients without compromise. Today's health care environment is costly, inefficient and ineffective. Evolve Physical Therapy + Advanced Wellness was created to rise above mediocrity and to excel at the highest level while positively impacting the lives of so many. Annie's most recent undertaking is the development of Meet Me At The Barn, a personal development organization designed to help people achieve their highest level of living. 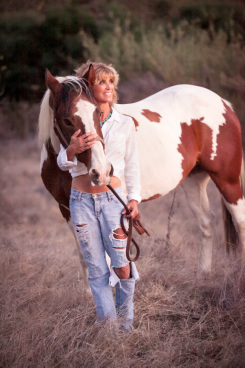 Meet Me At The Barn offers live and on-line courses that take individuals through a year long, ten step process of creating the life they want to live.